Twitter video downloader is a web application to download twitter videos online. Twitter videos are embedded in tweets. So to download any video from twiiter, you need to have the url/link of that tweet. Our twitter video downloader will extract the video from the tweet and then you can download that twitter video in high quality. 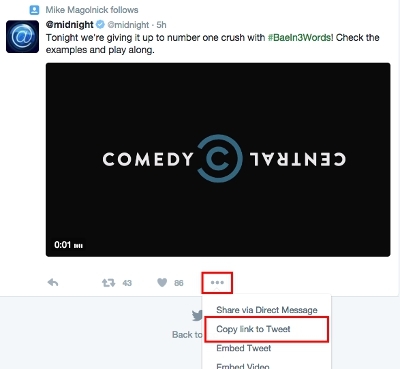 Its simple to use, see below steps to download twitter videos to your device(computer, mobile, laptop). Go to Twitter, click on the three dots(...), and again click on "Copy link to Tweet". As shown in the image below. You'll see the link/url of the tweet, right click and copy the link address. Paste this link in above input box and click on "Download" button. Our twitter video downloader will extract the video from the tweet and then you can download the twitter video.